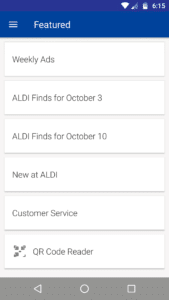 EDITOR’S NOTE: This review deals with the Aldi US mobile app version 3.9 (release date August 2018). We will periodically update the review if the app experiences a major change in features or performance. While mobile browsers come standard with every smartphone, the market for smartphone apps is as vibrant as ever. They’re more direct, and they often come with bells and whistles not available on a standard website. 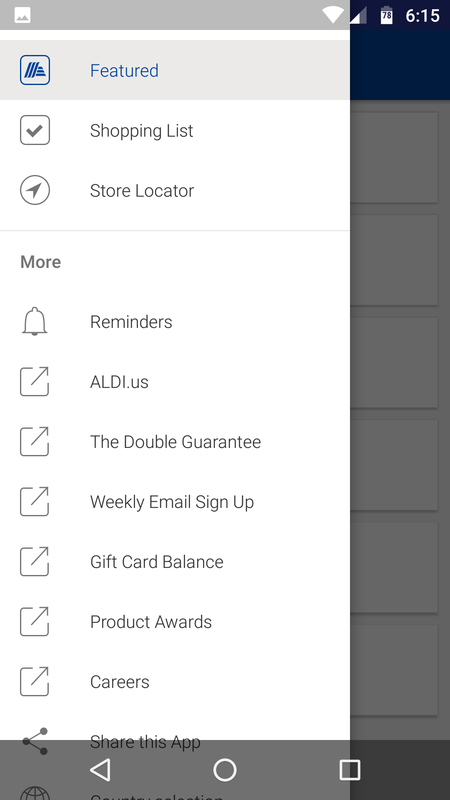 Aldi US has such a mobile app, available on both Google Play and the Apple App Store. (In some other countries, namely Australia and the Netherlands, the Aldi divisions there have apps for phone plans that Aldi administers. This review is not of those plans, and as of right now Aldi US does not deal in the phone plan business.) 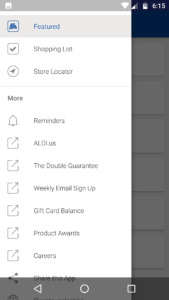 The Aldi US app is, like many apps, free on all platforms. This review is based on the Android version of the app, although the iPhone version appears to be largely identical in features. 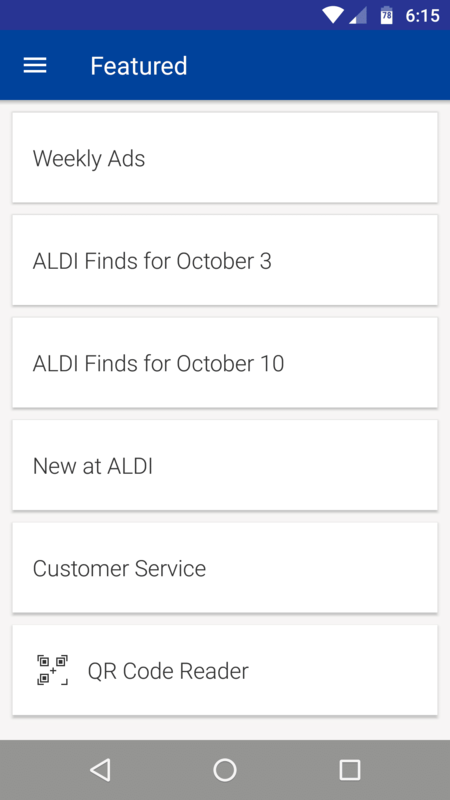 The Aldi app has a pretty clean interface. Upon opening the app, users are presented with a simple quick menu. There is also a side menu that has an assortment of other options. While having two menus may seem a bit strange, I think it works well, especially as the weekly ads get top billing on the main menu, which is probably the first thing people want to see in the Aldi ad anyway. For the most part, the mobile app is basically a skin of the mobile website. In other words, clicking on things just opens up the mobile website inside the app itself. That means that you could get a very similar, if not identical experience, using the mobile app. There are a couple of exceptions, though. For one, there is a shopping list function on the app that lets you create a list by clicking on products in the weekly ad. While you can click on things and add them to a list on the website, too, the shopping list on the app is much more convenient and effective to use. Also, there is a QR code reader in the app that lets you read QR codes on select Aldi products. Granted, you can accomplish the same thing by using a QR code reader app, but it’s still handy to have one encoded into the Aldi app, especially if you’re already using the app for a shopping list or checking out what Special Buys (ALDI Finds) are out there. Are there any negatives? A couple. One, the app does carry a few permissions, including location and camera access. I found most of the permissions to be reasonable, but if you’re particularly sensitive about privacy and phone access, you might prefer using the mobile version. Two, in testing the app on Android, I’ve noticed that when you click on a weekly ad, it downloads high-quality images for the entire ad. This is no big deal if you’re on Wi-Fi or a standard data plan … but if you’re on a budget prepaid plan and you’re away from Wi-Fi you might find the app eats through your data a lot faster than you may like. So keep that in mind if you’re currently using a limited data phone plan. It’s light, it’s intuitive, and it does everything the mobile site does, plus a few other bells and whistles. Lower-end data users should be aware that it does use a fair amount of data downloading images, but beyond that there is a lot to like here, especially for the price … which, of course, is free. If you’re a frequent Aldi customer, this is definitely worth a look.